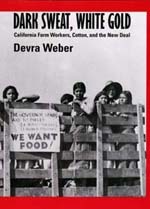 In her incisive analysis of the shaping of California's agricultural work force, Devra Weber shows how the cultural background of Mexican and, later, Anglo-American workers, combined with the structure of capitalist cotton production and New Deal politics, forging a new form of labor relations. She pays particular attention to Mexican field workers and their organized struggles, including the famous strikes of 1933. Weber's perceptive examination of the relationships between economic structure, human agency, and the state, as well as her discussions of the crucial role of women in both Mexican and Anglo working-class life, make her book a valuable contribution to labor, agriculture, Chicano, Mexican, and California history. Devra Weber is Assistant Professor of History at the University of California, Riverside.